MANILA, Philippines - The University of the Philippines (UP) College Admission Test (UPCAT) results for Academic Year AY 2016-2017 are out online on Thursday, December 17, 2015. 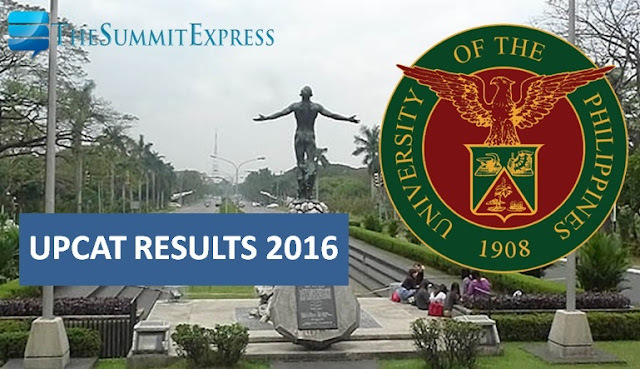 UPCAT was administered last August 30, 2015 in at least 25 campuses nationwide. Aside from the UPCAT website, results are also published on mirror sites. Note that UP used mirror sites to avoid slow loading of results page due to high volume of traffic on their server as results are released. Stickbreadsolutions and Preginet are the site mirrors that will redirect to UPCAT 2016 Results page. For SY 2016-2017, there is a decline in number of high school graduates who took the exams due to the implementation of senior HS as part of the K-12 Program. UP said that admission through the UPCAT will remain competitive and follow the same standards of academic excellence as in previous years. Note that Filipino graduates from the Top 10 of the graduating classes of public high schools may apply for freshman admission for SY 2016-2017 without having to take the UPCAT. This is provided by a transitory provision of RA 10648, the Iskolar ng Bayan Law. According to reports, only around 17% usually passed UPCAT every year or can be translated to an average of 10,000 out of 60,000 examinees can hurdle the exam.